so it's not my 21st birthday for another eight months, but there's no harm in an unattainable bag wishlist as a potential gift right? i love looking at john lewis for christmas gift ideas but i obviously got distracted and found myself clicking the handbags hyperlink and here we are. i won't like when i say the mulberry effie hobo bag is probably the ultimate bag at the top of my list i'd be over the moon if any of these were to land in my lap anytime soon. if you are going to fork out a consierable amount of money on a bag, to me it means it needs to be big enough to put your entire life in it. what good is a clutch that cost £500 that you can only use on nights out? if only i had £1k+ then the mulberry suffolk bag would be mine... or just get me the matching purse and i wouldn't complain. Ah that Mulberry is so pretty. Trust me to be drawn to the most expensive! Ugh that Michael Kors bag is calling my name! what do you use to create this type of picture? 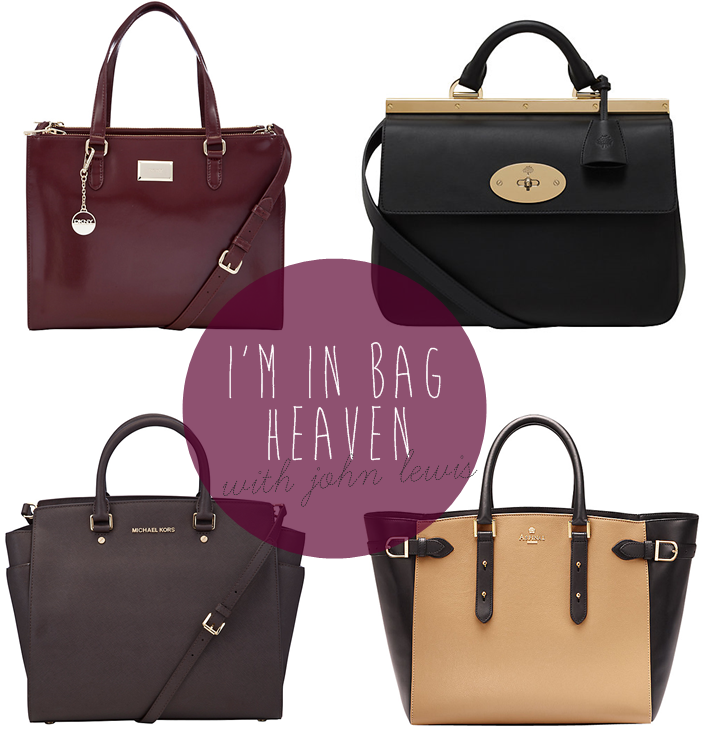 In love with all of these bags!